President Trump should also be worried about an unpopular health care bill passing. His overall job approval rating has climbed in recent weeks as news networks have been focused on hurricanes, but his approval rating has tended to decline when Americans are more focused on the health care debate. Trump himself has an approval rating of just 27 percent on the issue of health care, according to the latest NBC/Wall Street Journal survey. So why are Trump and congressional Republicans barreling on anyway? Republican voters want them to. According to a Politico/Harvard T.H. Chan School of Public Health poll, 53 percent of Republicans said repealing and replacing Obamacare was an “extremely important priority” for them. That 53 percent was higher than it was for any other issue polled.1 Lowering taxes, which Republicans are also gearing up to do, was rated as extremely important by just 34 percent of Republicans. The question therefore for Republicans is whether they want to pass a bill and upset the electorate at large or leave a seven-year promise to repeal Obamacare unfulfilled and upset their base. Neither option is all that appealing politically. It’s close in Virginia — Democrats were perhaps hoping that Trump’s unpopularity would allow Ralph Northam to run away with the Virginia governor’s race. It hasn’t happened. In an average of five surveys conducted this month, Northam is nursing a 45 percent to 41 percent lead over Republican Ed Gillespie. Northam may have more room to grow because African-Americans, who overwhelming vote Democratic, tend to make up a disproportionate share of undecideds in these polls. But also remember that the link between how voters feel about a president and how they vote for governor isn’t as strong as you might think. How students understand free speech — UCLA Professor John Villasenor published a poll this week in which college students offered their opinions on free speech. Among the findings: A plurality of students said the First Amendment does not protect hate speech (44 percent to 39 percent). A slim majority said it is OK for students to shout down a guest speaker (51 percent to 49 percent). And finally, 19 percent of all students (and 30 percent of male students) said it was OK for students to use violence to prevent someone from speaking. I highly suggest reading the entire poll. Moore remains ahead in Alabama — The Alabama Republican primary runoff is Tuesday, and the GOP establishment should be worried. Firebrand conservative Roy Moore led Sen. Luther Strange in two polls released this week — 53 percent to 47 percent in a Strategy Research poll and 50 percent to 42 percent in a JMC Analytics poll. Still, Moore’s 8-point margin in the latter poll is down from 19 points the last time JMC Analytics surveyed the race. Put another way: Moore is the favorite, but don’t be shocked if Strange pulls it out. Bill de Blasio is cruising to re-election — After New York Mayor Bill de Blasio captured nearly 75 percent of the Democratic primary vote last week, a new Marist College poll suggests that he may come close to that percentage in November’s general election. De Blasio was ahead 65 percent to 18 percent over Republican Nicole Malliotakis. Perhaps that shouldn’t be too surprising given the heavy Democratic registration edge in New York City. Remember, though, that New York didn’t elect a Democratic mayor in any of the five elections before de Blasio won in 2013. Trump’s job approval rating is 39.5 percent. His disapproval rating is 53.6. 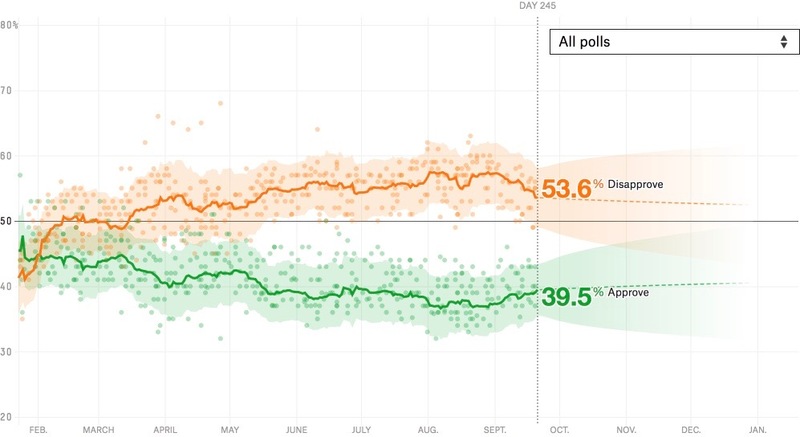 Both of those are improvements for Trump over last week’s 38.5 percent to 55.6 percent spread, and they continue a longer-term positive trend for the president. Just last month, his approval rating was below 37 percent, and his disapproval rating was above 57 percent. 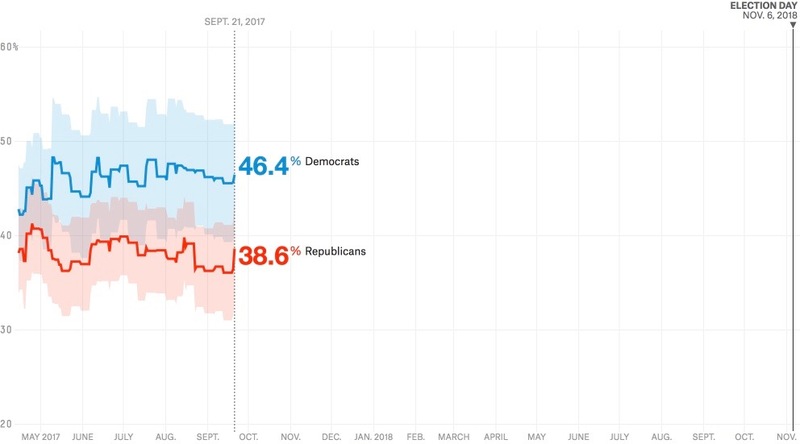 The timing of Trump’s improved numbers lines up pretty well with Hurricane Harvey making landfall in the U.S.
Democrats are ahead of Republicans 46.4 percent to 38.6 percent on the generic congressional ballot. That’s a slight improvement for Republicans from last week when they were down 45.5 percent to 36.0 percent. That said, Democrats (at 20 percent) were more than twice as likely as Republicans (9 percent) to say health care in general was their most important issue, according to YouGov’s latest survey.